Altimmune recently presented their HepTcell phase I results at the International Liver Congress in Vienna, Austria that provided some suggestions for designing the phase II study. HepTcell has a rough journey so far, but the company is not giving up despite the formidable competition and their impressive product candidates. I review some of the top competitors. My investment thesis is still dependent on the potential of NasoVax and the discounted market value of the company. The share price has almost doubled since the beginning of 2019 and the charts are showing signs of accumulation. I review the charts and show how the NasoVax news broke the bearish trend. On April 12th, Altimmune (ALT) presented Phase I HepTcell data at the International Liver Congress in Vienna, Austria. Altimmune's immunotherapeutic synthetic peptide vaccine candidate demonstrated admirable safety and justified the company's plan to move into a Phase II study. Admittedly, I have never been a huge fan of the HepTcell program for several reasons, one of which is Altimmune's competition for HBV. In addition, the HepTcell program has had a rough time with data readouts and has been the cause of some stock sell-offs. I was hopeful the recent clarification on the "bad" data and presentation would start to repair the damage; unfortunately, the presentation didn't contain any ground-breaking information that would have facilitated a big move in the share price and the market seems to have shrugged off HepTcell for the time being. I aim to review HepTcell and its impact on the ALT share price. In addition, I analyze some of the competition and present who I think stands to be the biggest threat in the HBV market. Additionally, I examine some of the key points from the presentation and what that means for investors. Finally, I take a look at the charts to see how the share price is developing in this volatile market. In March 2018, Altimmune publicized interim data from their first-in-human assessment of HepTcell, in patients with chronic hepatitis B infection. The company gauged two-dose levels of HepTcell one with a TLR-9 agonist adjuvant and the other without. Both doses presented admirable tolerability and achieved the primary safety endpoint. Even though there was evidence of a response in cellular immunity with the HepTcell arms, the incomplete analysis presented elevated median levels of HBV-specific T-cell activation in the placebo group. This was a bit of a headscratcher and made the data look as if HepTcell is not very effective. This news decimated the share price and was the start of dramatic sell-off through 2018. Altimmune completed the interim-analysis and was exhilarated that the two adjuvanted HepTcell arms had strikingly superior T-cell immunity over baseline than the placebo group. Furthermore, I was happy with the post-hoc evaluation that recognized a robust immune reaction and a greater responder rate in the two adjuvanted HepTcell dose groups when matched to placebo. Altimmune has faith that the fresh evaluation provided a strong indication of HBV-specific immune activation by HepTcell and now plans to move into a phase II study. Looking at the presentation, I did not find anything remarkable in the analysis. However, Professor Mark Thursz concluded that the phase II program should comprise of a "broader HBV patient populations including eAg+ and chronic carriers." In addition, the professor recommended a longer dosing period and the addition of antivirals to be used in combination with HepTcell. These recommendations tell me that HepTcell is going to need assistance to elicit an adequate response in the T-cells. The company has already added an adjuvant and now will seek to employ an antiviral. I can see why the market didn't react in a positive manner to the presentation. One of my apprehensions about the HepTcell program has come from the notable competition. HBV has a multitude of companies attempting to find a cure to the chronic disease using several different methods. One of the more promising candidates is siRNA agents that perform RNA interference "RNAi", by prompting the gene to be silenced at a post-transcriptional level. However, this form of therapy has some challenges that include reduced siRNA stability, ineffective cellular uptake, extensive circulation, and non-specific impacts need to be addressed before a product makes it to market. I don't expect one of these therapies to be approved if it can't eliminate the off-target effects and unwanted immune-stimulation. Some of the leading companies in this arena are Arbutus Biopharma (ABUS), Roche (OTCQX:RHHBY), and Arrowhead Pharmaceuticals (ARWR). I have been keeping a close on their progress and have been impressed with Arrowhead's progress and pipeline. In fact, Arrowhead just presented results from their Phase 1/2 clinical trial assessing their HBV candidate, ARO-HBV, which is now licensed to Johnson & Johnson's (JNJ). Arrowhead/JnJ's chronic HBV candidate demonstrated efficacy and was able to reduce at least a 10-fold decrease in HBsAg in 40 out of 40 subjects with no serious adverse events reported. This should be concerning for Altimmune and anyone betting on HepTcell to be the front-runner in the cure for HBV. Another potential type of HBV treatment is "entry inhibitors" that are anti-HBV molecules that bind to the NTCP hepatocyte surface protein. One of these inhibitors is Myrcludex B that is being developed by privately held MYR Pharma. The company believes that Myrcludex B could facilitate the long-term eradication of HBV and fight against hepatitis delta virus "HDV". In addition, the company has received orphan drug designation by the FDA and EMA for the HDV indication. A different approach to HBV comes from a large group of capsid inhibitors that take aim at the production of HBV by interfering with the breakdown of the capsid when the virus passes into a cell. A few companies have attempted this route, including Arbutus and JnJ. However, I found the recent phase IIa data from Assembly Biosciences (ASMB) and their ABI-H0731 product used in combination with nucleotide therapy to be very impressive. The company believes the data demonstrates that a "faster and deeper declines in HBV DNA and HBV RNA are possible with combination therapy." I am not sure how this stacks up against other methods but the company's abstract was "selected for inclusion in the 'Best of ILC' presentation" at the same conference Altimmune presented at. Finally, I discovered Replicor's HBV pipeline that employs nucleic acid polymers "NAPs" HBsAg inhibitors to decrease HBsAg which interferes with the immune system's ability to fight off the virus and ultimately overpowers the patient's immune reaction, consequently, permitting the infection to turn into a chronic state. Replicor's agents have shown the ability to reduce circulating surface antigen to "undetectable levels" in a 20-week treatment, however, they are still years away from being on the market. Not only is the competition made up of HBV specialty pharmaceutical companies but it also includes Roche and JnJ…the 2nd and 3rd in pharmaceutical revenues in 2018. Considering the competition, HepTcell is going to have to pull off an upset in their phase II study. Who is the top dog? I have to give it Arrowhead and JnJ. Not only did their siRNA product show efficacy but it was lacking any serious adverse events, which was a major concern in RNAi therapies. The charts have been covertly turning bullish over the past couple of months. Looking at the daily chart (Figure 1), we can see the share price slowing climbing away from $2.50 and found a holding pattern above $3.00. I understand this is not champagne worthy but the share price has almost doubled since the start of 2019. The hourly chart (Figure 2) reinforces the bullish trend and shows the share price moving away from the long-term downtrend lines. Another positive point to note is the number of overbought vs. oversold signals on the RSI…3-0; which provides me assurance the sentiment around the stock is trending positive. 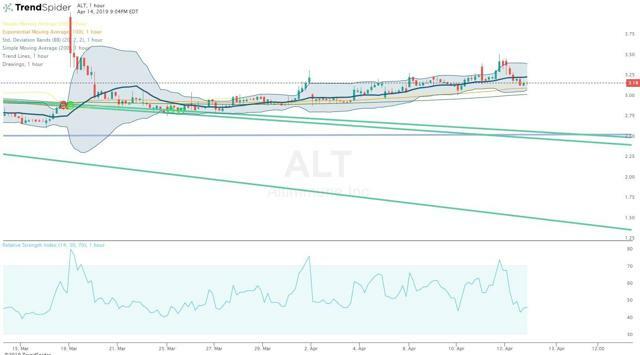 The break from the downtrend happened on March 19th, which was the day Altimmune announced updated NasoVax data and the company's intent to find a partner for their flagship product. Since then, the stock has been showing some hallmark signs of accumulation. Obviously, the market is reacting to the partnership news and it was not a transient event. Indeed, HepTcell still remains my least favorite Altimmune prospect due to the meager research about peptide HBV treatments. My disinterest in HepTcell turned into a repugnance with the preliminary readout in March 2018. The data suggested that the HepTcell was safe but not operative compared to placebo. The company had trouble deducing the data because the marks of the treated subjects were not very dissimilar than placebo controls. As a result, many investors assumed HepTcell is not statistically superior to placebo and was a complete loss. Even though the interim data analysis clarified some of the confusion, the market had already dismissed HepTcell and hasn't given it a second look. The conclusions contained in the recent presentation tells me the company is most likely going to have to rely on an antiviral help to make HepTcell a viable product for HBV. Logically, this doesn't provide me any additional confidence in HepTcell and had reignited my aversion for the program. In my first Altimmune article, I wanted the company to either drop the HepTcell program or put it on hold till NasoVax was further along in the regulatory pathway. Now, Altimmune believes it has strong enough data to proceed into Phase II. However, I will not put too much optimism into HepTcell and its prospects on the market. The competition is closing in on all sides with a variety of strategies to discover a functional cure for HBV. Altimmune might have a viable product to treat HBV but what are they going to do if they make through the FDA? How crowded is the arena going to be with a hodgepodge different treatments going for the number one spot? I believe HepTcell is going to need a distinct advantage over other products and will require brand name partner to survive on the market. I am not confident about those prospects right now but perhaps the phase II study will change my mind. What about the rest of the company? In my last Altimmune article, I expressed my excitement about the recent NasoVax data and the company's decision to look for prospective partners to get it through the FDA and on the market. I feel as if this announcement is the cause of the slow rise in the share price and the limited sell-offs. 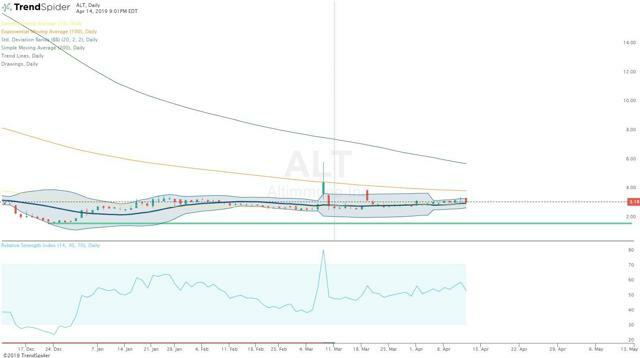 Even though ALT's share price has almost doubled in 2019 the market cap is still only ~$42M and trading at a price/book value of 0.58 (Figure 3). It is the potential NasoVax partnership and the stock's current value that has me stalking another buy at some point in Q2. At this point, I have completely removed HepTcell from ALT my investment thesis. I remain focused on NasoVax and the value that a big name partnership could bring to company and stock. To me, everything in the pipeline is a distant second and will remain there till NasoVax is on the market. Even the emerging immunoncology pipeline is just noise till Garg inks a NasoVax deal. After the inks dried, I will take a look at where HepTcell and the rest of the pipeline candidates are heading. Disclosure: I am/we are long ALT. I wrote this article myself, and it expresses my own opinions. I am not receiving compensation for it (other than from Seeking Alpha). I have no business relationship with any company whose stock is mentioned in this article.